Golf has been part of the sporting landscape in Scotland since at least the 15th century when King James II banned the game by Act of Parliament in 1457 and there is mention of the game being played on a number of courses along the east coast of the country during the 16th century, including Carnoustie (1527), Aberdeen (1538), St Andrews (1552) and Montrose (1562). Courses that developed at these locations, and many others that emerged along the coastline, from Dornoch in the north to Dunbar in the south, still present a formidable challenge to golfers in the modern era. By 1880, there were 42 courses in play around the country and that number doubled over the following decade at the start of a golf boom that would last for around 30 years. Incredibly, a further 200 courses emerged in the 20 years between 1890 and 1910 as the popularity of golf soared during a period of industrial growth. The next 70 years saw a slow and steady growth before the next golf boom of the 1980s and 90s, bringing the total number of golf courses in Scotland to around 500. That number has since risen to over 580 at the end of 2010. There is a legend that shepherds, while getting bored tending their flocks, used to hit stones into rabbit holes with their wooden crooks near St Andrews. They became adept at this and it led to the birth of golf on the greens of Scotland. 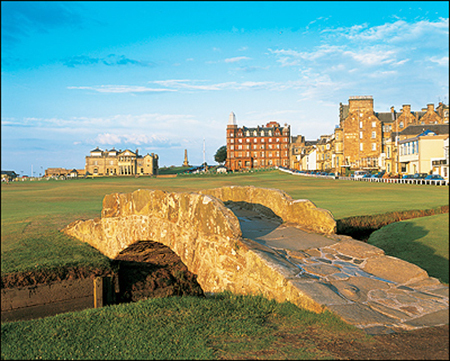 St Andrews is known worldwide as the “home of golf”. This is in part because the Royal and Ancient Golf Club, founded in 1754, exercises legislative authority over the game worldwide (except in the United States and Mexico), and also because the famous links (acquired by the town in 1894) is the most frequent venue for The Open Championship, the oldest of golf’s four major championships. Visitors travel to St. Andrews in great numbers for several courses ranked amongst the finest in the world, as well as for the sandy beaches. The modern game of golf is generally considered to be a Scottish invention. A spokesman for the Royal and Ancient Golf Club of St. Andrews, one of the oldest Scottish golf organisations, said “Stick and ball games have been around for many centuries, but golf as we know it today, played over 18 holes, clearly originated in Scotland. The account book of lawyer Sir John Foulis of Ravelston records that he played golf at Musselburgh Links on 2 March 1672, and this has been accepted as proving that The Old Links, Musselburgh, is the oldest playing golf course in the world. There is also a story that Mary, Queen of Scots, played there in 1567. For any serious player, experiencing golf in Scotland is absolutely essential. Scotland’s east and west coasts are littered with the spectacular links courses that are so inherently Scottish; famous names from Open Championship history such as St Andrews, Carnoustie and Turnberry offer golf breaks with a slice of history in golf’s home, while Gleneagles’ Perthshire landscape offers unrivalled inland beauty. Golf Guides USA recently visited Scotland in order to experience the homeland of golf and report back our findings. Our story is a single narrative of that trip, told as it happened to a traveling group consisting of both golfers and non-golfers. The focus, of course, is on all the great golf we played...click here to see the full feature story.